French architect Jacques Rougerie has designed a cross between a skyscraper and a boat for exploring the unchartered territories of the earth's oceans. Named SeaOrbiter, the vessel is meant to accommodate a team of 18-22 researchers, who will be able to spend 24 hours a day underwater. Marine scientists will use the facilities to study relationships between the seas and the earth's climate, while archaeologists will be able to further explore ancient shipwrecks and astronauts will be able to use the pressurised environments to simulate the experience of being in space. With construction apparently set to begin next year, the 58-metre-high boat will be assembled from recycled aluminium and will weigh approximately 500 tonnes. It will travel with the ocean's currents, but will also harvest energy from the sun, wind and waves to propel itself when necessary. 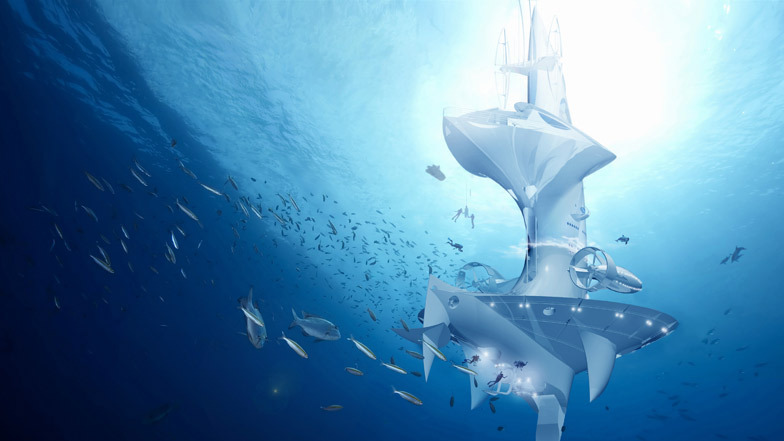 The concept has been developed following over 30 years of research into marine architecture and is currently being exhibited at the 2012 World Expo in Korea, which is dedicated to oceans and coasts. We recently filmed an interview with designer Thomas Heatherwick about his futuristic design for a riverboat - watch it here. Imagine a silvery ship, drifting with the currents at the very heart of the oceans. To encourage dream and give rise to vocations for the new generations in order for them to create their own tools in favor of awakening, sensitization and action of all for the integration of the ocean in our attitudes and behaviors to come. To explore the ocean still widely unknown in order to refine knowledge about marine ecosystems, to better understand the influence of oceans on climate notably in the current context of global warming. By the nature of its design and the objective of its mission, SeaOrbiter is also an excellent academic tool about the marine environment, its environmental and climatological components address all generations. Thanks to collected images that accompany the comments of observer- aquanauts, SeaOrbiter will contribute to the awakening of minds to what is at stake in the conservation and the responsible use of the marine environment. Indeed, thanks to the technologies of numerical imaging it will furnish a resource that will favour a sensitive, even coalescing relationship, for the public with the marine environment. This is by no means a small stake for the latter. Drifting according to the great marine currents, SeaOrbiter has its place in all the great oceans and in all the most important interior seas. Being linked with an observation satellite network, the SeaOrbiters of tomorrow will permit the continuous observation of the biggest climatic phenomena and the setting up of a preventive system reducing the risks run by the populations living on the coast (i.e. 70% of the world populations). The SeaOrbiter project has brought together men and women who share a common dream in terms of the progress of mankind and his environment: the quest for knowledge and experimentation that has always helped humanity to develop from its origins, to extend its horizons and push its limits ever further. Just as space exploration undeniably transformed mankind’s perspective of planet Earth, it is certain that a better understanding of our planet’s oceans through the study of the undersea depths of the marine world represents one of the major challenges of the 21st century. The SeaOrbiter project is based on an innovative technological approach that has resulted in a new generation of ocean exploration vessels, a human adventure in the spirit of the great multidisciplinary explorations of past centuries. It will allow its crew members to benefit from an overall vision of the underwater world and will allow them to actually observe, listen and live 24h a day and during long terms periods, under the sea. SeaOrbiter is a unique vessel whose technology allows mankind to live at the heart of the world’s oceans, to drift within the major oceanic currents, to carry out observational studies and enjoy a direct and permanent access to the marine environment. In that sense, SeaOrbiter is truly a unique mean of communication, of sensitization and of education upon the theme of the oceans. The 51 m-tall semi-submersible vertical structure includes a submersible section of 31m. The vessel is kitted out with oceanographic observational and sonic equipment coupled with satellite facilities. It can house an international team of 18 people among those 6 scientists who will benefit from the platform to proceed into various research programs with regards to SeaOrbiter’s observation and analysis abilities. SeaOrbiter has a multi-level atmospheric pressure module and a pressurised module. The latter is open undersea, allowing the 6 to 8 aquanauts to live permanently at the heart of the ocean and to have immediate access to the marine world. The lock chamber connects with the atmospheric pressure upper decks housing the crewmembers in charge of logistics and responsible for preparing supplies for the aquanauts. This integrated undersea habitat is also a real space analog, favouring the organisation, over long periods, of experiments, model testing and analysis in terms of confinement and in terms of the crew’s reactions to life in this extreme environment. That is why the international space agencies are likely willing to participate to some unique undersea living world records. In fact the astronauts involved in the NASA’s NEEMO programme are already preparing long distance crewed journeys from their fixed undersea habitat. SeaOrbiter is an exploration vessel designed to allow observation both above and below the surface of the ocean. The section that remains above the surface houses the navigation and communication equipment. It has an open-air deck for observing cetaceans and documenting migrating species. The submerged section can be considered as a mobile observatory. In addition to its large portholes, this observation post has vast panoramic windows that give the crew a superb and constant view of the surrounding marine life. Furthermore the vessel’s general acoustic pollution is minimal and creates the ideal conditions for observation of undersea sound activity. The automated measuring equipment allows the scientists to obtain in situ analysis of the water samples taken. Deep underwater exploration tools such as remote cable-operated, robotic video cameras, manned pocket submarine or AUV’s will extend SeaOrbiter’s investigation possibilities up to 6000 metres. SeaOrbiter reveals oceans to a new generation of residents, otherwise known as aquanauts: i.e. scientists, explorers or simply visitors to the undersea world. With a key task : to inform and educate public at large about the ocean and its role into the planetary system. » Mankind living under the sea: studies led in parallel with space agencies on the physiology and the psychology of a crew living in a confined environment for long periods of time. » Exhibitions in museums, aquariums, Oceanographic Institutes and Marine life centers. We hope that the SeaOrbiter’s missions will be regarded as universal and international, both in terms of their management and in terms of the release of the information about the discoveries that are made. The missions represent an experimental platform for French research bodies (Ifremer, Comex, the Institute of Research and Development, CNES, etc. ), European bodies (European Space Agency) and International bodies (National Oceanographic and Atmospheric Administration, NASA, Woods Hole Oceanographic Institution, Scripps, University of Hawaii, Kordi, etc. ), all of which have already expressed their interest in the project. All these features make SeaOrbiter the first nomadic home wandering amidst the mightiest of gardens: the ocean. A true sentinel arising above the main oceanic streams, it will host an amazing human adventure where science, education and communication will play a key part just as they did in the great maritime explorations of the past centuries. Onboard this ship, and for the very first time in the world, a crew of 18 to 22 will be able, and over very long periods, to live under the sea, 24 hours a day, and continuously observe the underwater world. With one vessel drifting in each main ocean and major seas, SeaOrbiter will set up a new standard of communication through a true network of sentinels where scientists will, in real time, be able to enhance their monitoring throughout the blue planet. Towering at 58 meters in height, this true polyvalent experimental laboratory, exemplary in terms of sustainability, will allow testing of many innovative technologies, notably those linked to the use of renewable marine energies and will allow the opening of new area of application in the field of the marine molecules, whether for human sustenance or the pharmacopeia of tomorrow. Equipped with multiple sensors and linked with satellites and automatic buoys networks, it will allow reinforcement of scientific knowledge about oceanic impact on the atmosphere and the planet’s climate changes. Amidst its many applications, SeaOrbiter embodies a revolutionary yet logical osmosis: the union of the abyss and the cosmos. Fitted with a pressurized module serving as a true space simulator, SeaOrbiter will enable astronauts to test their ability to live in an extreme environment and carry out experiments and tasks just as they would do in space. It will also allow underwater archaeologists to spend more time over remains of ancient times and wrecks of the past centuries. All tests carried out at Marintek, Europe’s largest simulation laboratory located in Norway, proved successful. The greatest storms could not affect SeaOrbiter’s stability nor hinder its operations. Bearing the spirit of adventure which lives on in humanity, SeaOrbiter has been conceived to give a basis to a large educational plan concerning the oceans. SeaOrbiter, a multidisciplinary scientific vessel and a tremendous teaching and educational tool for sustainable development will contribute, thanks to renowned scientific bodies, the World Ocean Network and their many international research programs, to set up and develop a new relationship between men and the ocean. Allowing reinforcement of marine values and better commitment from the younger generations with regard to the planetary challenges of tomorrow, this vessel will also enrich our knowledge and enlighten our hopes with the promise of new horizons. ￼SeaOrbiter is an exploration vessel and a drifting sub-marine as well as marine observation platform permitting the in-situ and a continuous observation of the marine ecosystem, the monitoring of the physical and chemical parameters of the ocean /atmosphere interface and the development of research on human behaviour in extreme situations. The original idea and design of the vessel created by Jacques Rougerie goes back to Jules Verne on the one hand, and inscribes itself on the other hand in the coherence of French expertise in this type of activity. Expertise recognized in the entire world for almost 100 years. It was all of his experience that permitted him to conceive of this vessel that drifts without perturbing the environment and where the adventure is lived on the inside as well as on the outside of a platform giving unrestrained access to the underwater world. In addition, the SeaOrbiter concept is characterized by an assembly of innovating new technologies and of the creative genius of its designer, allowing the combination of tools and of observation spaces often unique in the world and authorizing at times an unheard of boldness with regard to the observation of the live marine environment. It follows the line of Bathyscaphe, the first observation submarine in waters of great depth, of the Cousteau adventure and its induced developed technologies, of the groups of solitary or team navigators that cross the seas in search of a better understanding of their reality in order to master it - in extreme conditions at times – thanks to highly innovative and performing boats. This is the case with SeaOrbiter today. SeaOrbiter, by its conception, authorizes a continuous observation of the ocean and of the sub-marine world and over long periods that could be extended to an entire year. Today, no other technological observation platform for the ocean or oceanographic ship follows the same standard of coherence of observation of marine and sub-marine phenomena. Thus, there is a complementary nature between SeaOrbiter and the tools furnished by organizations such as Marine Nationale or the IFREMER in France (for example: “Pourquoi pas?”, recently built) or other reputed organizations in the world, as in Japan with the laboratory ship “Chikyu”, in the United States with the programs “Scripps”, “Wood’s Hole” and the NEEMO installations and others still in Scotland. This observation and exploration vessel will permit the welcoming of multidisciplinary teams coming from multiple domains of scientific research, helping in this way to develop the necessary transverseness of scientific disciplines for understanding the complexity of climatic, biological, atmospheric and natural marine phenomena. Many great European and international institutions of national research have already shown their interest in using this platform. Programs of research are currently being defined with many Universities and research centers.